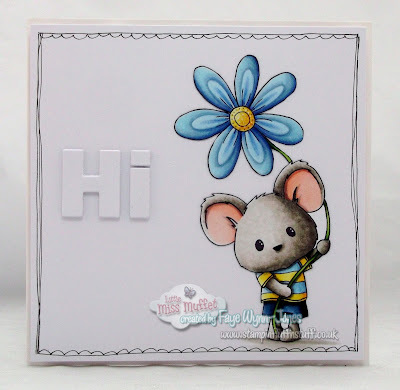 I'm flying today, but, I'll stop long enough to tell you there's a new Challenge over at Little Miss Muffet Stamps... Anything Goes. So cut and lovely Faye!!!! Awww, look how cute! I love the doodled frame too! Oh my goodness, this is absolutely fantastic, Faye. And I don't like mice! 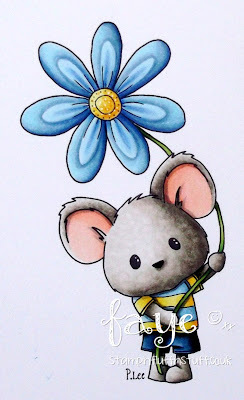 He is flipping cute and the way you colored the flower petals is fabulous. The doodled frame is perfect. Thank you for the wonderful eye candy!! How Cute is this Little Guy. Gorgeous Colouring on your Flower too! OH he is just darling! Wow, fabulous colouring. I particularly love the flower.